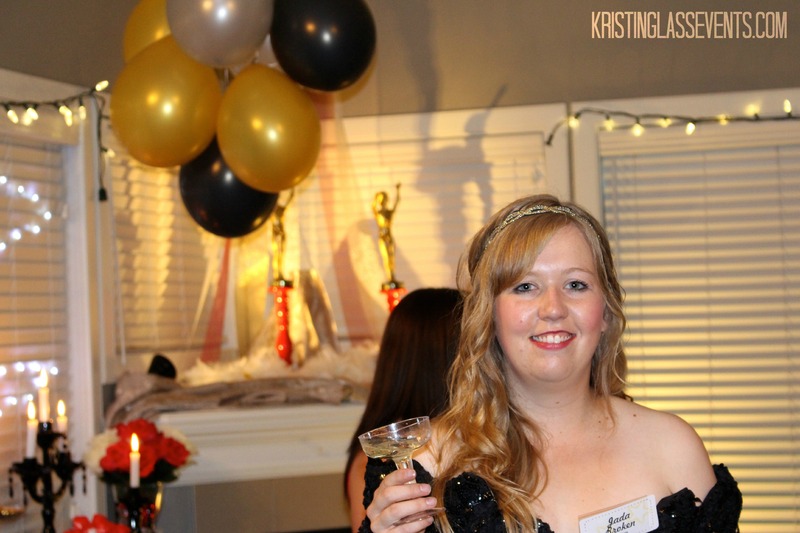 I recently hosted a Hollywood themed Murder Mystery party, and I’m here to share some of my planning tips. For décor ideas, tips, and tricks, check out “Dazzling the Stars – Hollywood Themed Party Décor”, or for mystery ideas check out Night of Mystery. 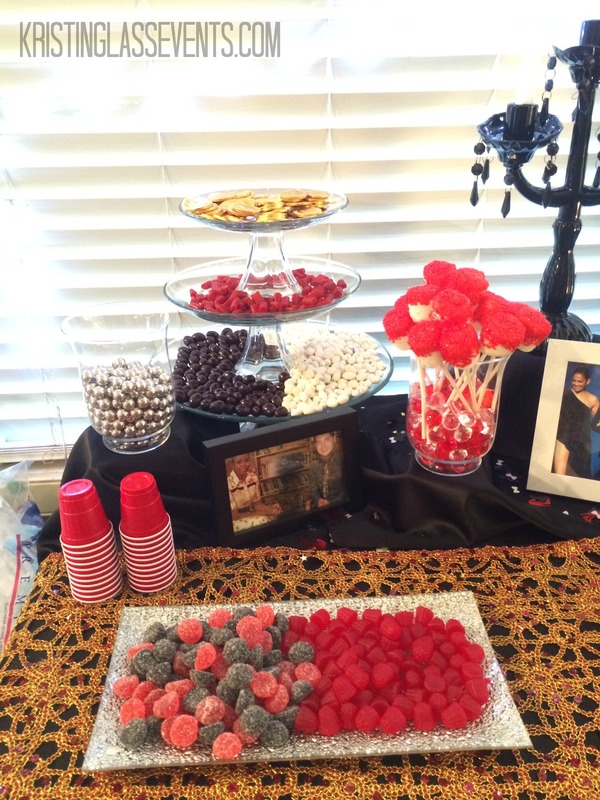 I had so much fun putting this party together and you can too! Read on for my easy and fun Hollywood party menu ideas. I love including a candy bar at an event because it can really add a lot of colour. For this one, I collected clear glassware and used only red, white, silver, gold, and black/brown candies. My selections included those silver cola balls, chocolate loonies, red nibs, chocolate covered almonds, yogurt covered raisins, and a selection of red and black berry candies. I also put out shotglass sized red solo cups so people could take a selection of candy to other areas if they wanted. Those cute little cups are perfect for this use! The marshmallows on sticks that you see above are super cheap, super simple, add some colour to the table, and are delicious. To make them, simply stick a lollipop stick into a marshmallow, then tip it upside down and dip it in water and then your choice of sprinkles. Display in a vase with some crystals, stones, or other items in the bottom to hold them up. Don’t they look fabulous? Popcorn was a very natural addition to the party spread – it’s easy and inexpensive, plus this was a Hollywood-themed party, and popcorn definitely fits in with that vibe. I fresh popped the popcorn right before people were arriving and topped with butter and salt and pepper. This is something you could get really creative with if you have some more time! I had actually looked up a couple fun popcorn recipes that I hoped to try, but ended up falling short on time on the day of the event. Of course, everyone was met at the door with a glass of champagne. I hope this helps you to pull together your very own Hollywood party! This theme really can be a lot of fun, and I hope I’ve given you some ideas for putting together a Hollywood party menu. Come back and let me know what else you did in the comments!